It is time for this month's stamp reveal at Your Next Stamp today!!! 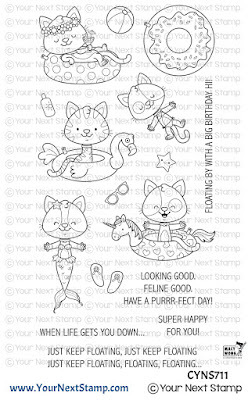 We have so many cute stamps with matching dies, gumdrops and a fishy background being released today. It is so exciting when new products are up for grabs. In order for us to share these new products we are having a BLOG HOP today with the design team members and guests. The hop starts today until April 7th so hop around and check out the amazing cards this team has created. If you'd like to win a Gift Certificate to the store ...keep reading! 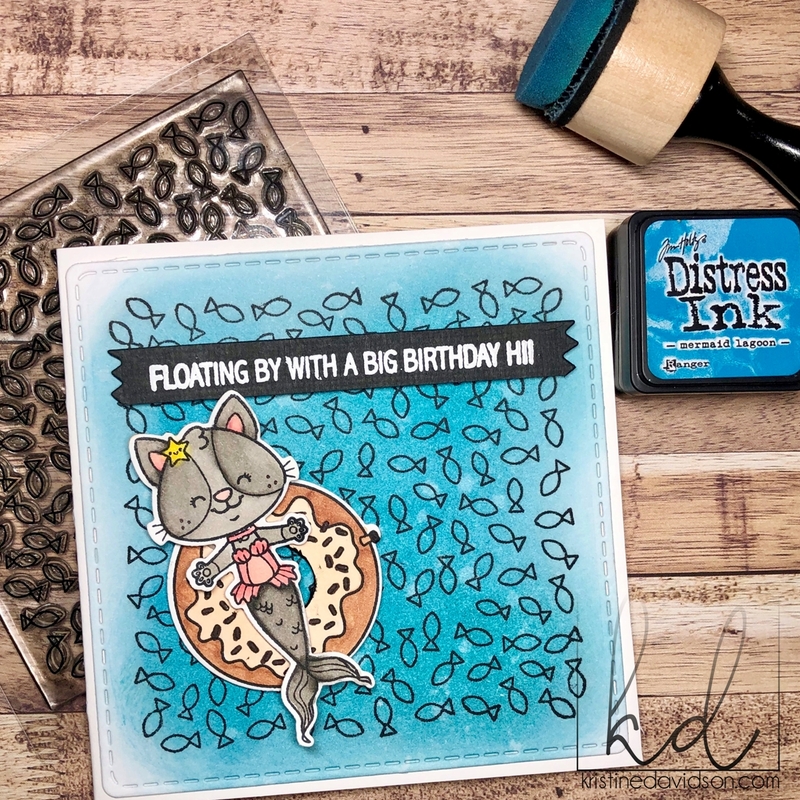 Fishy Background and the Just Keep Floating Stamp Set with Dies. I first stamped the background image on white Neenah 80lb Solar White Cardstock and then added some Distress ink. 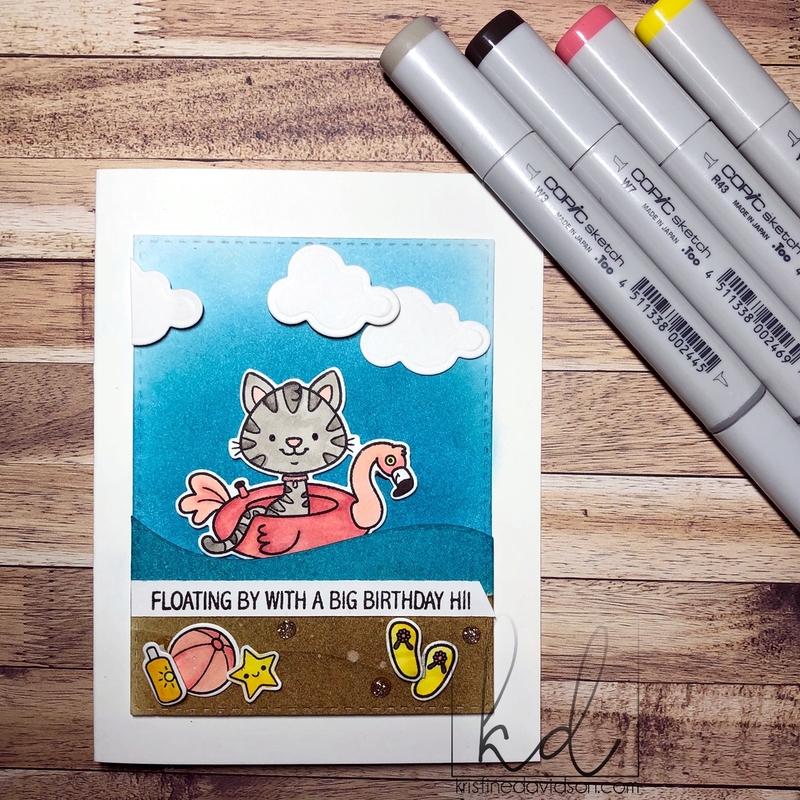 I colored by little floating kitties using Copic Markers. I used the metal dies made for these images and cut them out - no fussy cutting for me! I then added some dimensional adhesives behind the kitties and floating donuts to create some dimension. I hope you enjoyed your time here and please come join the other team members on this reveal day! Save 20% Off Your entire Purchase!!!! Hurry! A $25 Gift Certificate to spend at YNS! to be entered to WIN! Thanks for hopping along with us! 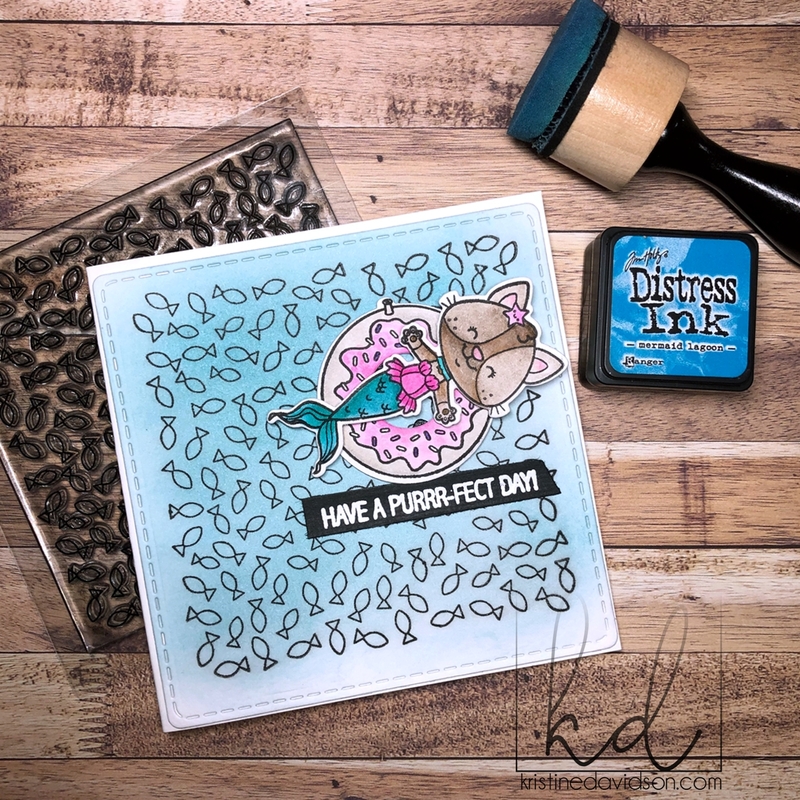 It's time for a Sneak Peek of Your Next Stamp's April Release! Kitties sitting in floaties? I mean how cute is that? 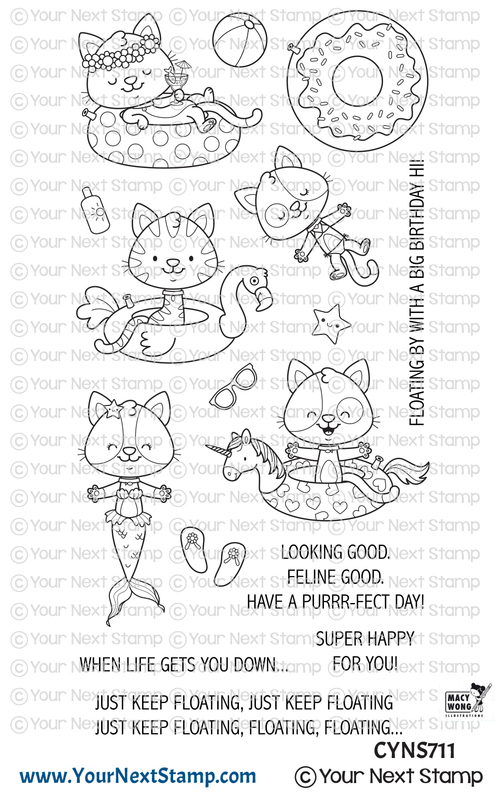 Today I am featuring a set called "Just Keep Floating"
Of Course as a cat lover these stamps were purrrfect for me ! 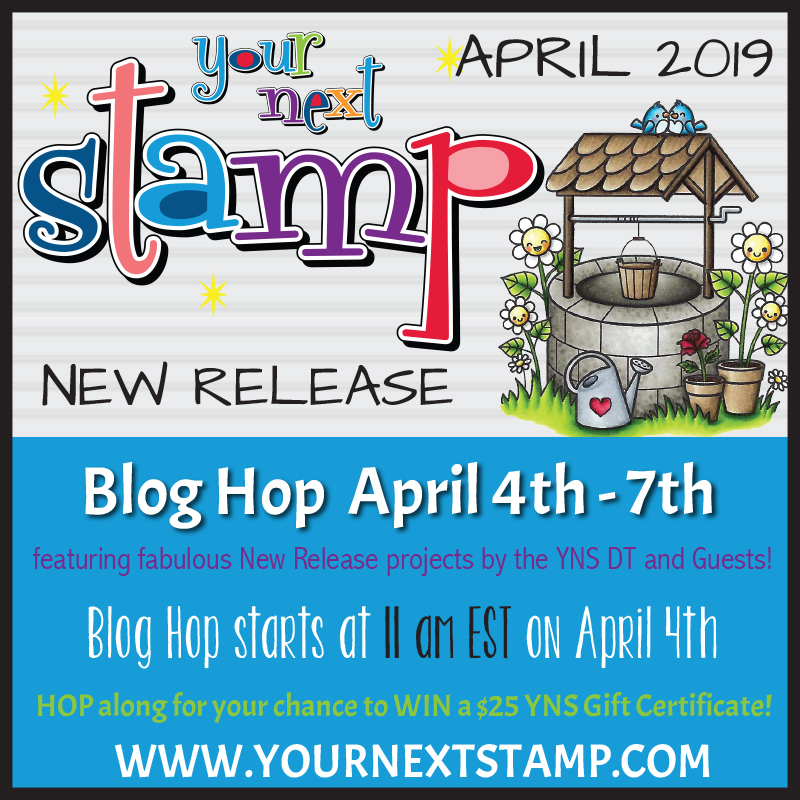 Lots of Sneak Peeks are waiting for you at the Your Next Stamp blog!!! Thanks for visiting and see you again soon! 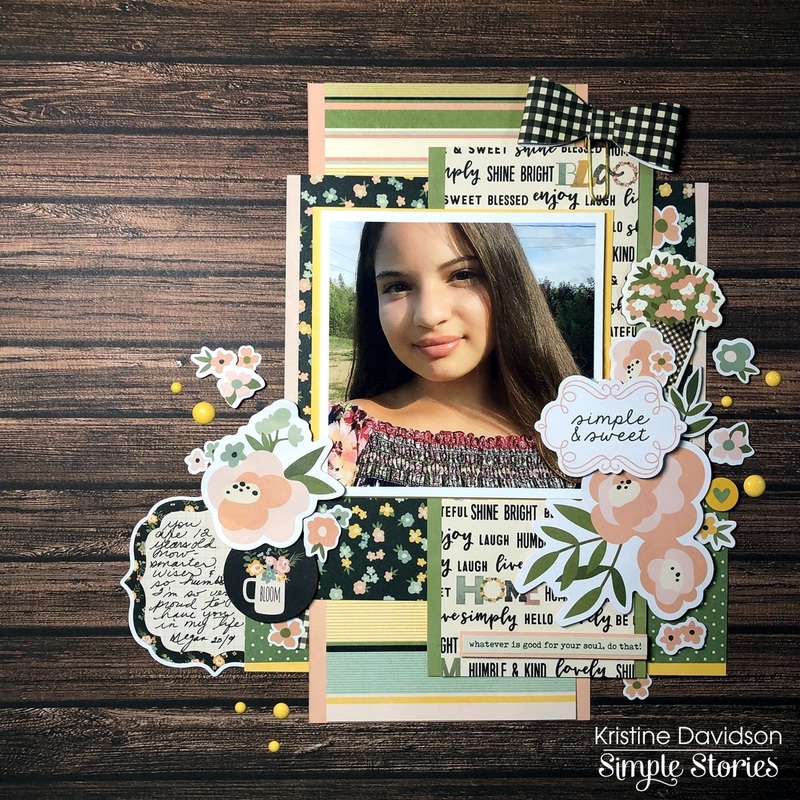 This layout is called Simple & Sweet using the Spring Farmhouse collection. As you know I don't fuss about my titles that much and this layout is no exception. I used a diecut from the Bits & Pieces and found one that would be perfect for my niece's attitude and simple pleasures. If you ever feel stuck with a title perhaps look thru those diecuts and pick one that you can relate with. You can always emphasize a title by adding dimensional adhesive or surrounding it with flowers or other embellishments. I started my base with an Elmwood background from the SN@P! Basics Paper Pack. If you don't have this collection in your stash -- go buy one! It is a must have. 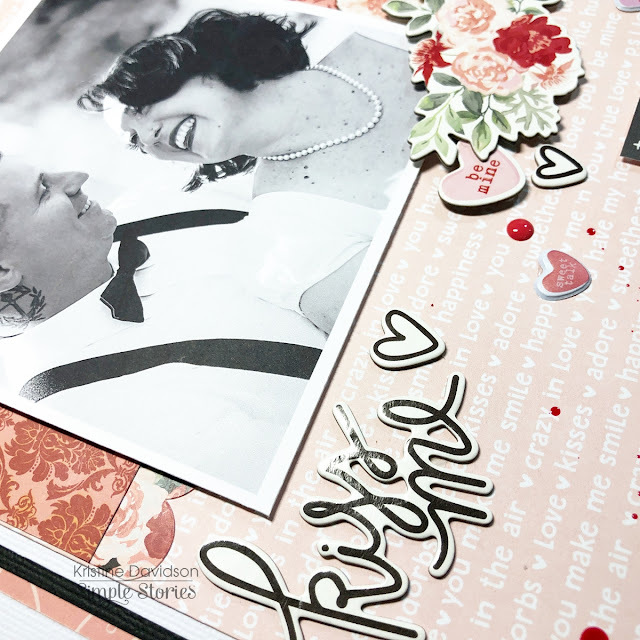 I wanted this layout to have layers and have of those gorgeous 6x8 papers. I love the smaller paper patterns because they allow me to use small photos and they don't overcrowd my page or photos. Does that make sense? 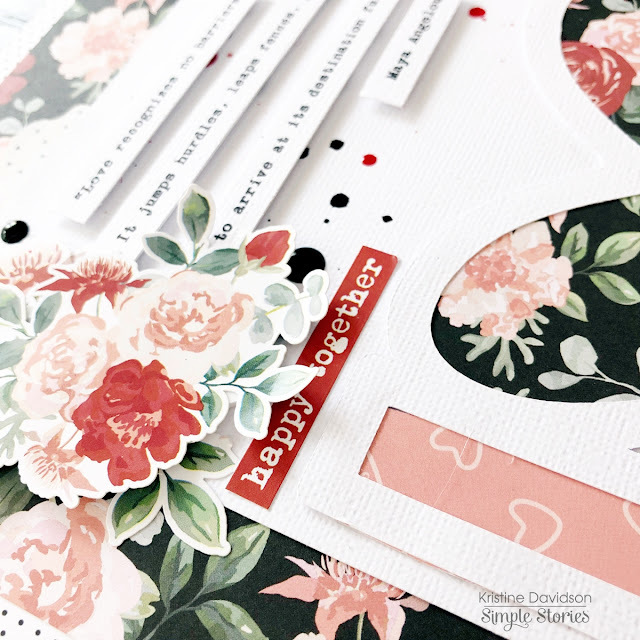 I also wanted to mat some of those papers and I used the Simple Basics Kit that match the Simple Farmhouse collection beautifully. The Simple Basics Kit includes solid colored cardstock papers that can be used for cards, base colors on a layout and so much more. 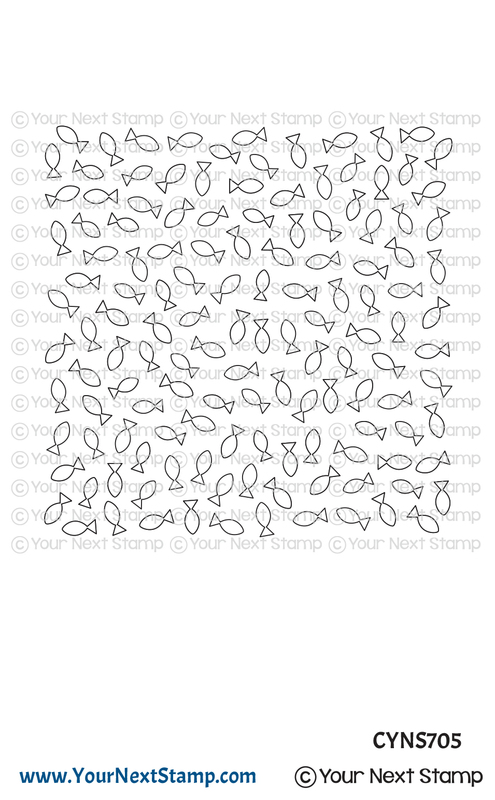 I used these papers to mat my patterned papers. You can see on this picture that I have them matted in assorted colors. I love that little extra pop of color. Cute right? Adding those solid colors behind my patterns added some extra color on my page and made them visually pleasing. Try something new today! 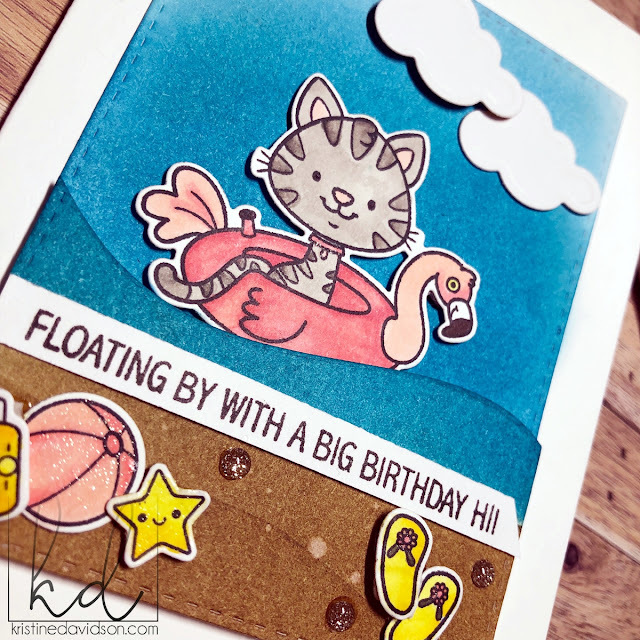 Maybe you have left over cardstock or solid colored papers that you can use on your next layout. Give it a try! Visit Us on Instagram @SimpleStories_ and @KristineDavidson for more projects using Simple Stories. 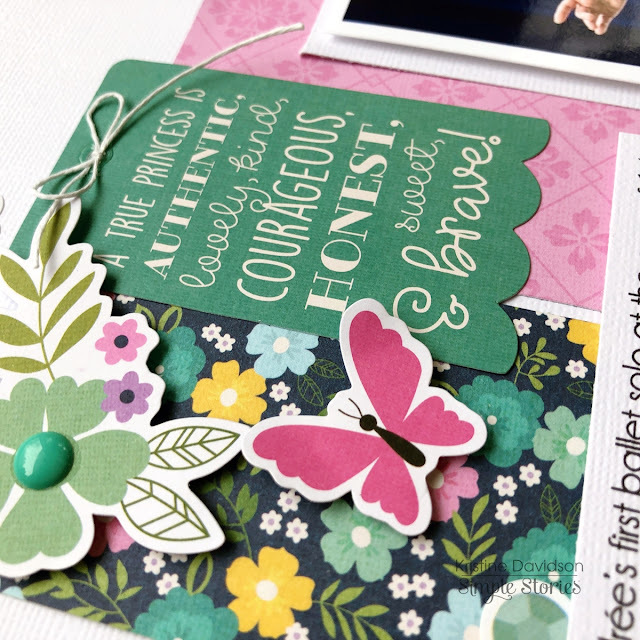 I am sharing a layout I recently created using the NEW Little Princess collection from Simple Stories. 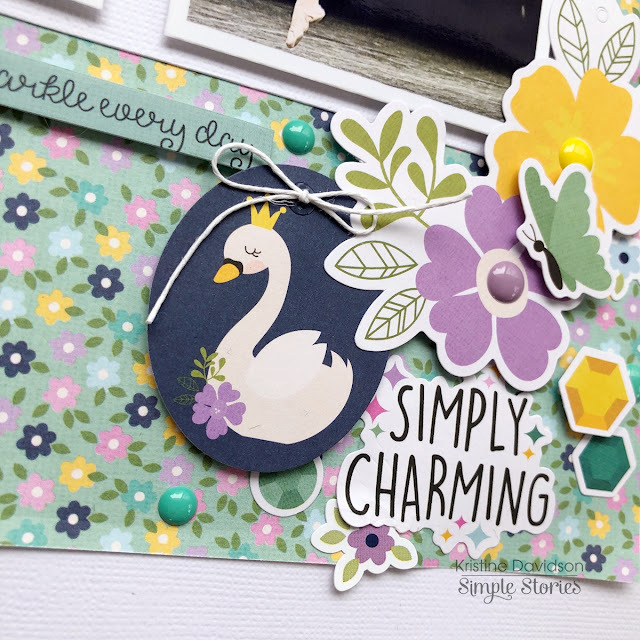 This collection is filled with wonderful elements such as princess diecuts, beautiful tags with swans, quotes, bright flowers and so much more. The pink in this collection is a nice bright pink a bit on the fushia side and it would make any page look so spectacular. I am sure you will love this collection for your little ladies. I used a photo from one of my friends daughters who is in dance. The dark blue background from the photo went well with the blue in the flower papers and it gave my page a great contrast in color. This little lady is also so charming and a wonderful dancer as well! The small flower stickers, the enamel dots and diecut sequins really add some extra details to a page. I created my layout by first using 3 pieces of 6x8 papers and cutting them in different sizes. I placed them on a white piece of cardstock and left a small space between them to show a bit of white in the back. I did use my fingers to curl the edges of the papers for some detail. I added a tag with a swan and placed some dimensional adhesive to give some height and dimension to my diecuts. I added a little piece of twine to the tag but you could also use an enamel dot or leave it as is if you wish. I also added enamel dots on my flowers and popped up my butterfly. I used one of the cutest princess' from the Princess Bits & Pieces. Take a look at all these options available to you from this little packet! Aren't these amazing? I hope you enjoyed my layout today and please come join us on social media. 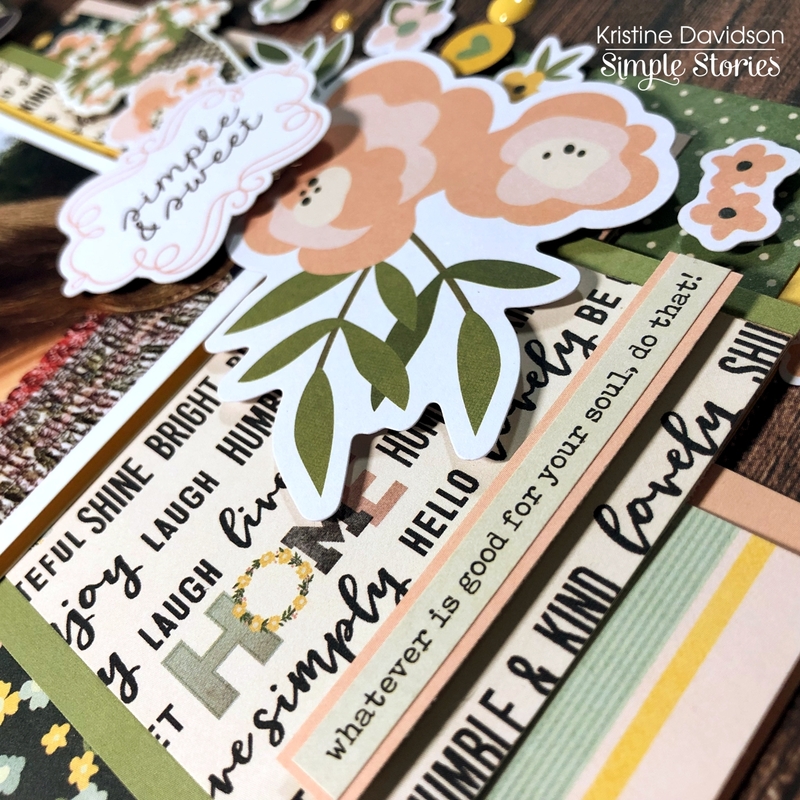 Simple Stories post daily inspiration that will surely give you some ideas for your own scrapbook projects. @SimpleStories_ or myself @KristineDavidson on instagram. 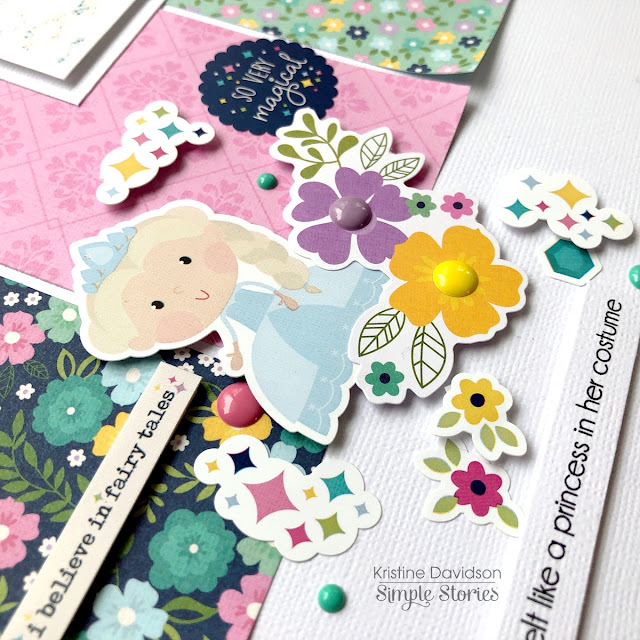 Can't wait to see your pages using this super cute Little Princess collection. I am so very excited to be joining Simple Stories as a designer for another year. I've been with this company for 5 years and I can tell you they are AMAZING! They provide so much inspiration with new designs, colors, products and ideas for scrapbookers. If you know of Simple Stories I am sure you've had a chance to create with their products. If you ever need ideas for new projects come visit them on instagram @SimpleStories_ or on Facebook. 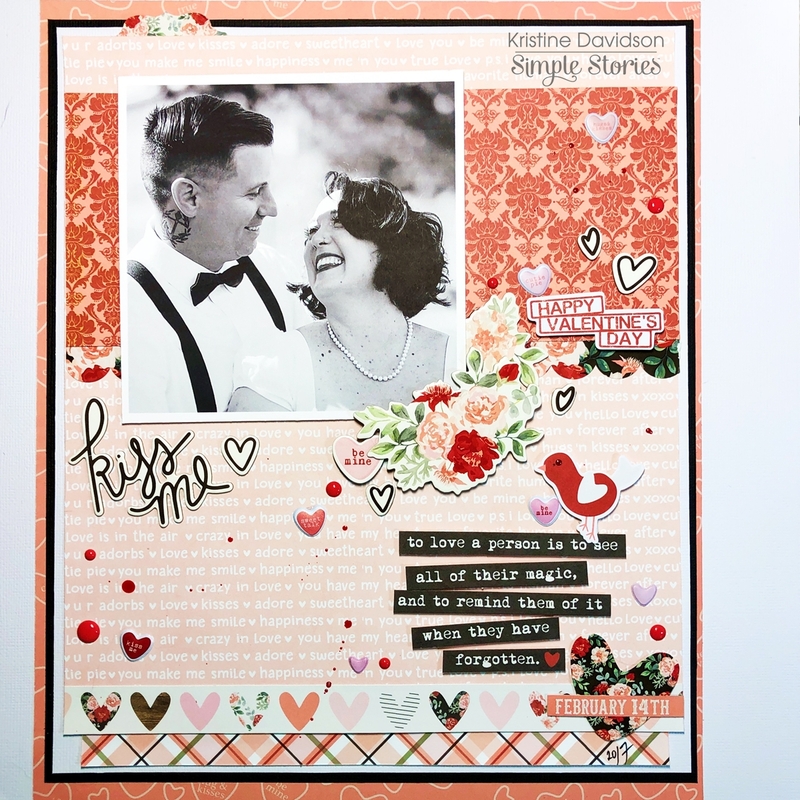 It's Kristine with you today to share a layout using the Simple Stories Kissing Booth Collection! 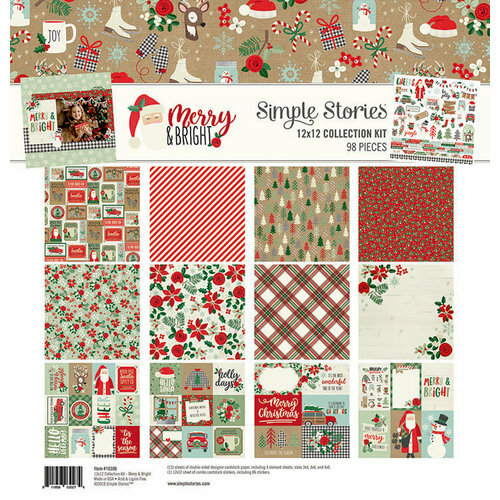 I cannot get enough of this collection with it's super cute patterns and lovely die cuts. I created another layout using my cousins wedding picture. It's perfect for this collection isn't it? My layout is called KISS ME. It measures about 9x12 but I added it to a piece of white cardstock to make it 12x12. I used a black cardstock to mat the layout and create a contrast with the pink/red colors. I used a quote from one of the 4x6 element cards for my journaling. 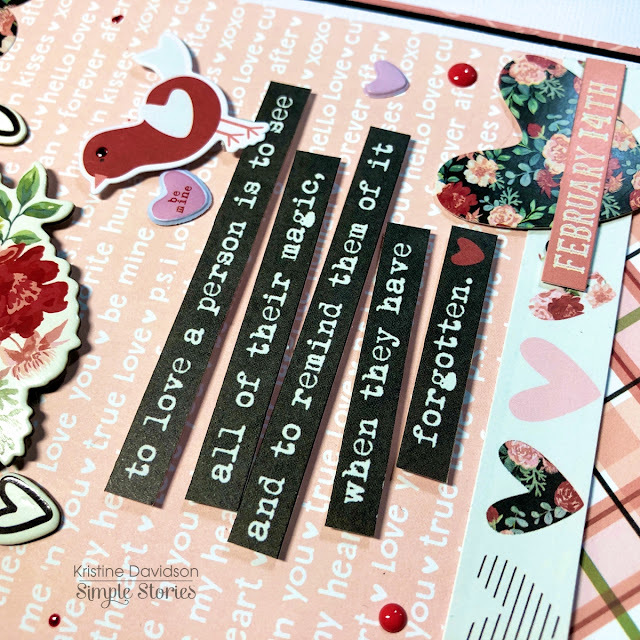 I didn't want to add my own journaling for this personal layout so I thought that using the quote would be perfect to add some words to the page. Those elements cards are perfect to cut apart! I printed a picture that measures 5x5" square and I really love this size. I added dimensional adhesive to the photo, the journal strips, and the chipboard pieces. Adding a few enamel dots, paint splats and some of those tiny puffy hearts created a great little details for me. Such a great collection to play with - for weddings, valentine's day and many of those special moments. 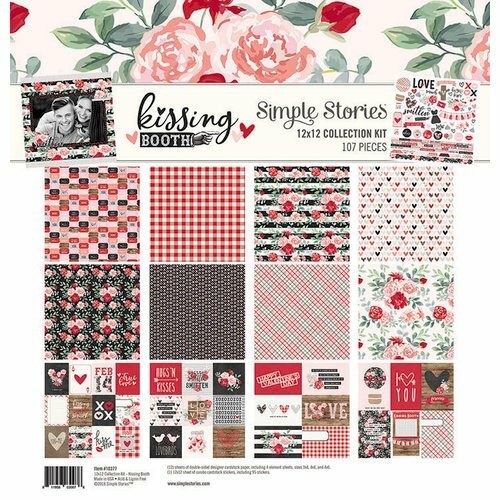 I hope you have a chance to create with this KISSING BOOTH collection and please share your creations with us on social media! It’s Kristine with you today and I’m sharing a little LOVE today! 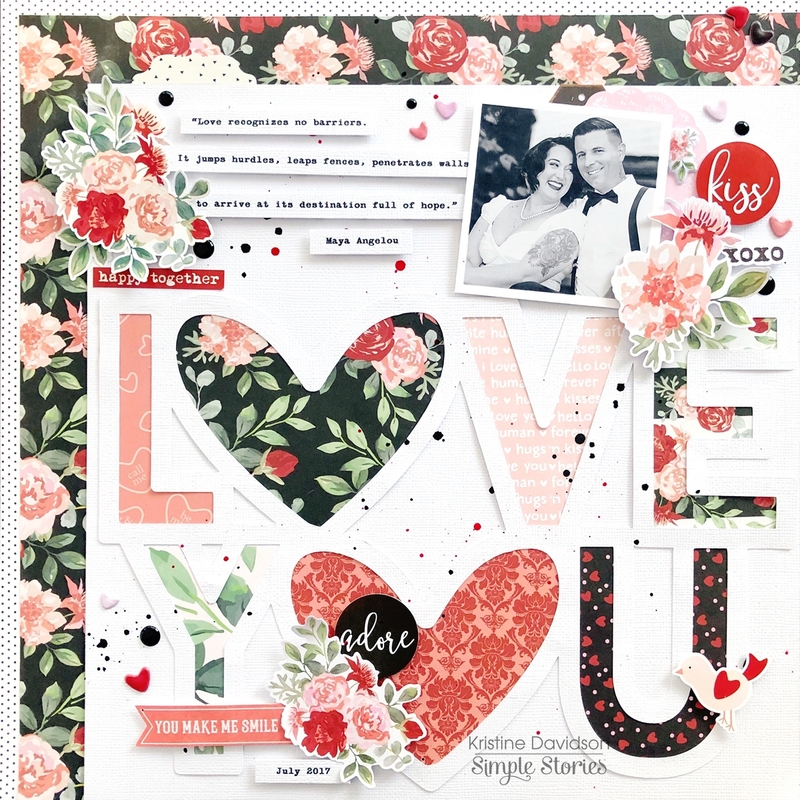 I created a layout using the Valentine’s day collection from Simple Stories called Kissing Booth. 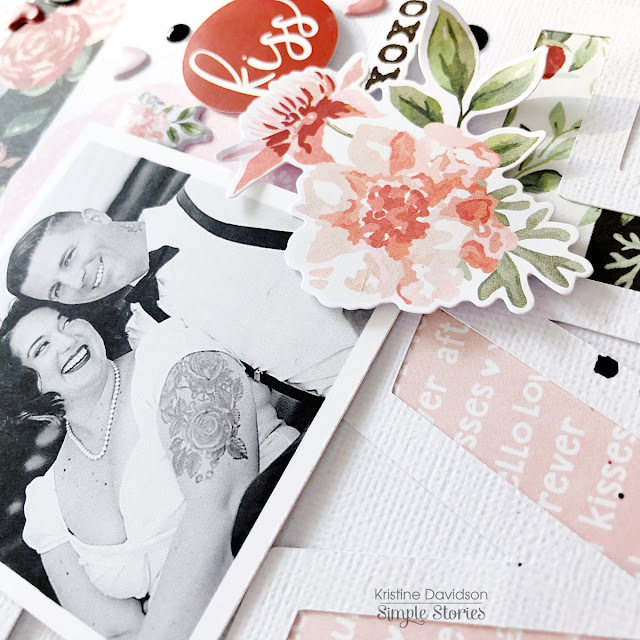 I used a photo of my cousin and her husband for this layout and a cut file from Paige Evans. The cut file allowed me to use several pattern papers and then I was able to add some Bits & Pieces! Creating layers on layouts always gives such beautiful dimension and even a bit of texture. Add some adhesive that is dimensional under your diecuts and stickers and see what effect this gives your page. 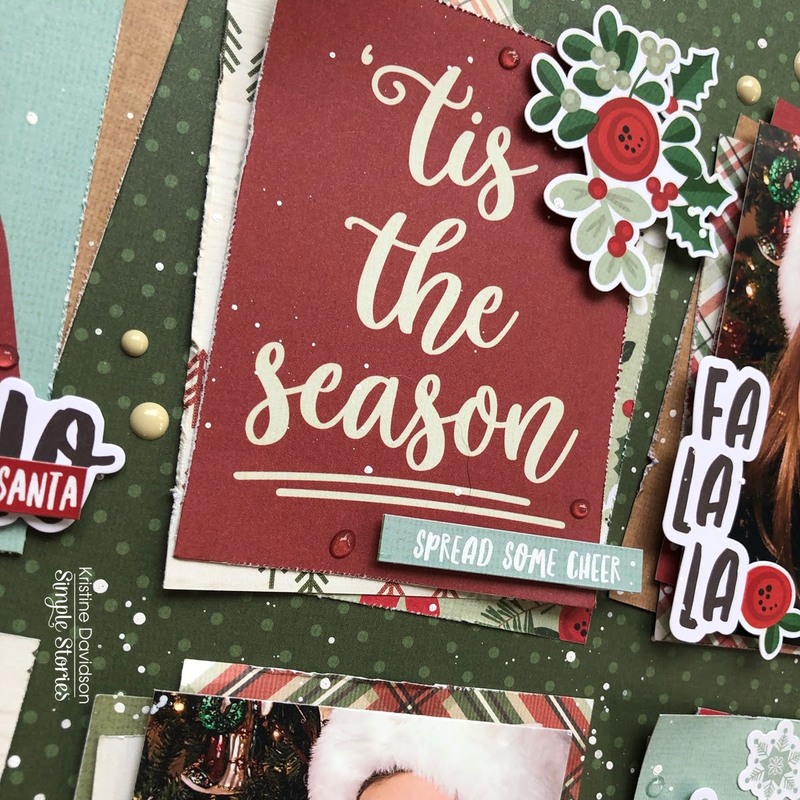 You can add layers to titles, photos, diecuts and even your entire cut file on a piece of cardstock! 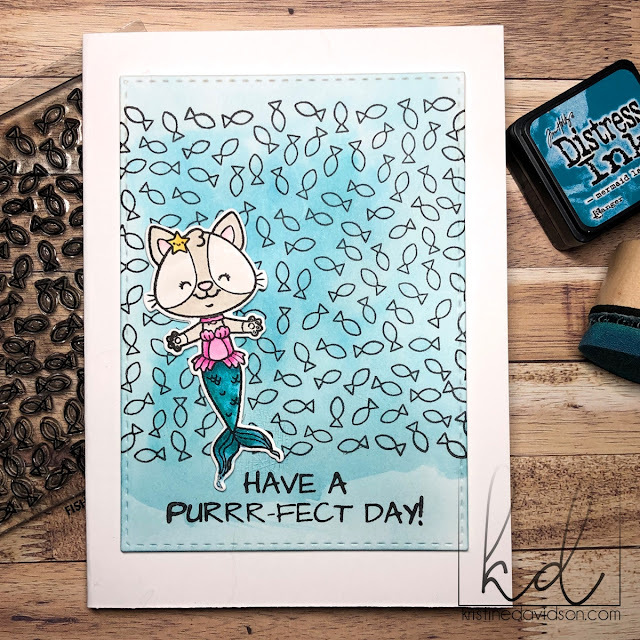 I added my cut file on a piece of white cardstock and then to add interest and color I added it to the bottom right of my page. The cardstock is cut 10”x10” and gives me space to add some pattern paper on the edge of my layout. A few enamel dots and some paint splats adds interest to your page and eliminates a bit of that white space. 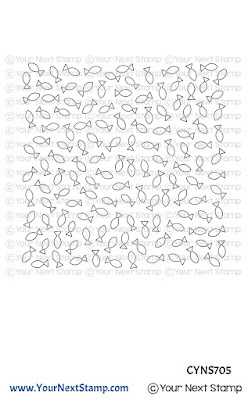 Some prefer not to use splats and that’s okay – why not try some of the small puffy stickers we have. 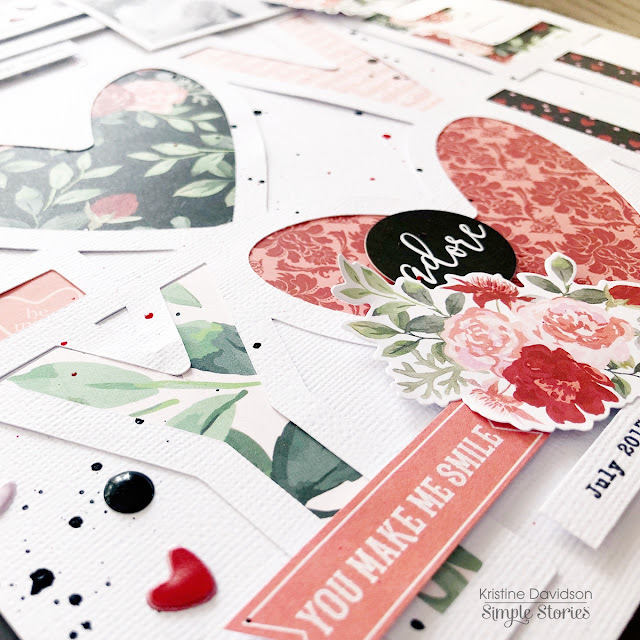 Those are super cute and you can add them anywhere ;) I added some hearts to my layout and love the little punches of love all over my page! It's Kristine here today to share a layout! Are you in a festive mood yet?! Well I haven't started decorating but when I created this layout it certainly got me inspired. 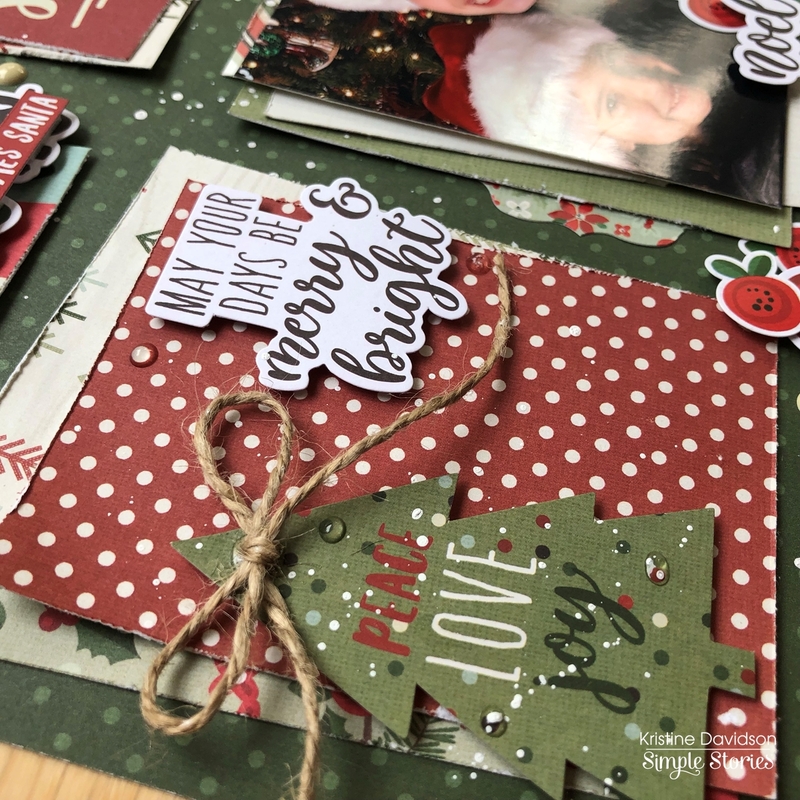 I used the Merry & Bright Collection and mostly used the 3x4" cards and the 6"x8" paper pad. I have always loved a grid layout. It's easy and great to use with those 3x4 element cards. This collection is filled with beautiful festive images including Santa, snowmen, poinsettias, and so much more. I used 2 photos measuring 3x4" of my nieces. This picture was taken a few years ago. I think it's time for another photo shoot if they would just cooperate... Teenagers! I layered pieces of 3x4 papers and some are overlapping at an angle and others are just there for layers. I really like how so many patterns of paper can all work together to create a layout. If you have any element cards laying around why not try this format? It's great for multi photo layouts, even double pages. Try it with this beautiful Christmas Collection. You'll enjoy it .. I'm sure! Happy Holidays to you and your family ! Copyright © Kristine Davidson. All Rights Reserved.